Mainframe operators using BMC software may now be able to enjoy the speedy, devops-style development pace that is quickly becoming the norm for customer-facing mobile applications and Internet services. BMC has released a plug-in for its Control-M batch control software that it claims can cut the time required to make a change in a business workflow by up to 80 percent. Workload Change Manager "allows customers to dramatically reduce the time it takes to roll out an application," said Gur Steif, BMC vice president of workload automation. "It allows application developers to request changes using a simple automated tool. It validates the requests, and automates the process of rolling out the changes to production." Today, customers of an organization may expect their apps and services to be updated continually. As a result, many development shops have adopted a devops (developer-operator) methodology, which calls for closer communication between developers and administrators to speed development time. Devops has been slow to arrive to the world of mainframes and other batch-oriented back-end systems, however. The processes for updating the workflow running on backend systems is still largely a manual one, Steif explained. 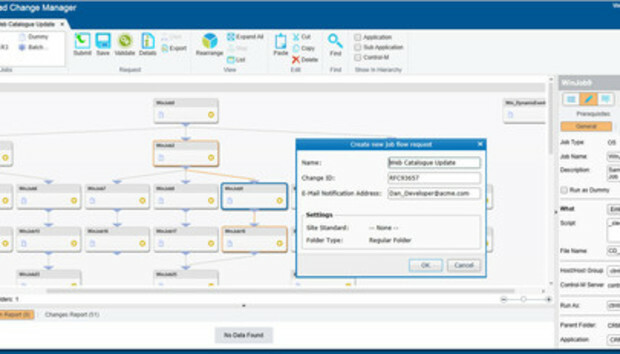 BMC's Control-M is a workload automation tool most widely used to control to timing of complex business processes running on enterprise software systems, such as SAP and Oracle's Peoplesoft. For instance Control-M could be used to control to collect external files from multiple business partner companies and submit them to an inventory management system, and then use the results to order needed items from external suppliers. Originally this batch process software was designed for mainframes, but it is increasingly used for commodity server-based distributed workloads as well. Typically, when a developer changes a workflow, the changes are written on paper or an electronic document, often known as a "change ticket." Such change tickets passed to the administrator, who reviews the changes, and makes the adjustments to the live system. Many times, this process of altering a workflow by hand involves multiple rounds of exchanges between the developer and the administrator. "An update can take weeks or months to get done," Steif said. The new Change Manager plug-in for Control-M offers a visual palette that developers can use to design and redesign their workflows using drag-and-drop components. The software automatically enforces system rules set by the administrator, and will automatically let the developer know if a certain procedure is not possible, given the organization's policies or the limitations of the system itself. BMC estimates that 40 percent of all developer change tickets are rejected due to a developer being unaware of some constraint. Change Manager also keeps a track of all changes made, for record-keeping purposes. Control-M is one of a number of batch scheduler software programs specifically designed to handle large enterprise software, such as ERP (enterprise resource planning) applications. Competitors include Advanced Systems Concepts' ActiveBatch, CA's Autosys, and IBM's Tivoli Workload Scheduler. Control-M Workload Change Manager is available now, starting at about US$10,000, depending on the size and complexity of the environment.